Today’s post is based on the mentor text, “I Hate Poetry”, by a Virginia middle school student. Her poem can be found here (and all the comments that she responded to individually. The comments tell exactly why she “hates” poetry!). Which version best matches your experiences? Jotted down some ideas to include. Decided that I wanted definite stanzas (so drafting outside of WordPress). Used the student’s ideas for the first stanza. Decided to repeat part of the first stanza in the closing stanza. #SOL17: Stuck or in a Rut? Two eyes, glowing in the reflection of my headlights, joined by another pair, and then another pair as I see the dreaded white flicker . . .
Not to be confused with those other deer, reindeer, also visible during this season, and recognizable by my two and a half year old grandson. Do I start something new? Do I begin at a different point? Is it time for a flashback? Do any of those responses sound familiar? What is the simple truth about getting unstuck? But return to your writing. Recopy your last word, line, paragraph or — to get your writing flow moving. Your writing does not need to be stellar. Your writing needs to be WRITING! but I feel productive because I continue to add words, lines and pictures to my blog post. What are those 3 sets of deer eyes doing? Where did my story go? Have you ever been lost, but found a totally different path? and then realized that path was so different it was unconnected, so now you had to go back to the original story? With work, revision, and some sharp scissors, this might become a circle story . . . I wish I had a plan. This was truly the randomness of my thinking. A variety of ideas floating through my head. But I did not stop writing.
. . . and wrote. It’s 321 words later and I’m still struggling to figure out where my story is going? Ankle deep? Knee deep? Waist deep? Up to my chin? And just like that the glowing eyes decided not to fight tonight. Not to risk life and limbs crossing the road. They merely paused . . . and stared . . .
And I blinked, slowed, and cautiously continued on my way. At this stage, what are you thinking?
. . . And why? Do you have tested-tried-and-true ways that work to get you unstuck? Or are you in a rut? Check out additional #DigiLit Sunday posts with Margaret Simon here. How does a post come to fruition? Here’s an inside look at the content and the process for today’s post. My idea was to tell how a post originated from one idea/ one tour during my recent trip to Rome. It was a topic that I briefly addressed two weeks ago (while in Rome) under the topic of Motivation here. My “S-Notes” on my phone which I used frequently on this trip. But WHAT am I going to write about the catacombs? This is the stage where I pour a cup a coffee, add categories and tags, go for a walk with Mya, because sometimes the “ideas” actually work themselves out in my head. I draft in my head multiple times before I begin to put fingers to the keyboard. I briefly addressed this topic in an earlier post. I thought I was done writing about it. But my brain won’t let go. I bought books at the gift shop. Books . . . books that I am currently reading . . . curious about the “bits and pieces” that I learned while traveling and now want to add to my knowledge. Google’s response to the word “catacomb” was that they were present in London, Paris and Rome. Many locations, many purposes, but my connection to “world civilizations” was in Rome. “Rome Catacombs” led me to some interesting sources including National Geographic and the Vatican. The Vatican source seemed the most promising as the National Geographic source had already pointed out that the Vatican owned all of the Christian Catacombs (numbering 40 known ones at this time). What specific information was I looking for? Our tour began with story boards and I was hooked. Our guide was amazing. The stories were riveting. And now I’m embroiled in learning more about the catacombs. Sixteen different popes were buried in this set of catacombs along with 50 martyrs. But this was also the burial place for the common persons during the second through fourth centuries. The oldest tombs are those in the top levels as later tombs were dug below those previously interred. What was the most interesting story for me? The story of St. Cecilia, the patron saint of music, who was martyred and who is also revered as an “incorrupt” saint. Incorruptibility is a Roman Catholic belief that divine intervention allows some human bodies (specifically saints) to avoid the normal process of decomposition after death as a sign of their holiness. Today, once I had settled on my topic, The Catacombs of Callisto, I drafted. I did not revise. I did do some minor editing – especially checking my quotation marks. I also used the spell check embedded in WordPress. What’s your digital writing process? Is it EXACTLY like your handwritten process? As we settled in to our seats In Milbank Chapel, Cornelius (AKA @MisterMinor) had these three questions on the screen for us to talk about with a person near us. What do you want to do in terms of workshop? What do you hope for in terms of “digital literacy”? What do you need to learn today to get you there? We had not even begun and Cornelius had us thinking about our goals and purposes for the session as well as “TALKING” and “doing the work”! I was quite happy as I knew I was in the “right place”today! Cornelius described himself as “a bit of a tinkerer” as he promised us cool techniques to blow up our writers workshop. That is an understatement as Cornelius has a great deal of knowledge about technology and always keeps his work practical! What could you do – more efficiently or effectively with technology? Cornelius reminded us that the writing process is everything. Tech in the past has ranged from a hammer and a chisel to reed and papyrus. We have more options if we consider his definition of tech – “any device that helps me do my work better”. (As I sit here with four devices open, I’m wondering about the “do my work better” part as tech has again failed me this morning, but more about that later!) 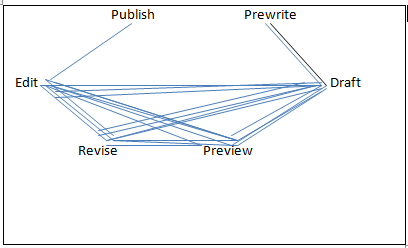 And to illustrate his point, Cornelius used the writing process as his organizing framework for his presentation! Simple, begin with talk. We were to find someone who was not our partner. Ah, yes, the dreaded workshop facilitator move of, “Get up out of your seat and go talk to someone somewhere else in the room!” Then we were talk to that person about where we were from and how we traveled to TCRWP. We returned to our original seat mate partner and told the story that our “new friend” had shared. What if students don’t have a picture? Send a device home so they students can take a picture and tell a story. Goal: Use technology to foster experiences, the source of narratives, so that talk can lead to writing! Content Area Idea Collections: We watched “Climate Change with Bill Nye 101” and then used Today’s Meet to “collect ideas from all the participants in the room. When you need ideas in response to something, consider “Today’s Meet” or even a common google document to collect those ideas. Or for additional ideas, find an expert in your community and face time with them so you bring video into the classroom and expand the world of your students! How can you increase production before drafting? Establish a personal help desk . . .
Students doing the work . . .
Increasing student agency because students are doing the work . . .
Cornelius called this the “hustle plan” . . . setting up students with their own personal help desk. Who are the three people who can help you when you are stuck? This list cannot include your teacher or your parents? Who would your three be? A brother or sister of a friend? Having a list of three people to go to for support and then setting up those lines! (Using phone to call and ask if the person would be willing to help when stuck!) Just think about who will be doing the work here . . . who is already building their own PLN? Use the camera on your device, any device, to tell your story. That may have been your rehearsal, but now it can also be a part of your drafting process. Before you begin drafting, think about the structure of your piece. Use the structure to help you tell your story! How can technology support Revision? An app to help with revision is “Skitch”. You can take a picture and then write, type or draw on top of that digital picture. Partners working on revision could actually annotate the text together! Use the app skitch to share text for revision and then consider multiple ways to revise – word, phrase, sentence, or paragraph levels. Where could a graphic be helpful? And the most important part of the writing process? Find real audiences for students outside your classroom! What’s your purpose for student writing? And what are you going to change, add or delete from your current writing process work? I shared my notes (in word) with my pc so I could return to using it now that I am back in Iowa. Surprise! Surprise! No menu bar in WordPress so I could not add a new post. So odd! Therefore, I continue to work on my personal Mac. I copied my notes from Saturday into the draft. I considered my own purpose as I felt the writing process framework was the heart of this post and the part that I needed to process in order to explain it to colleagues. (Any errors in the retelling are all mine!) My goal was to make this as doable as possible and yet also add text features to make it EASIER to find the main points in a reread of the text! I was anxiousing – so much to do – time was running out – so all errors would definitely be mine! #SOL16: March Challenge Day 17 -New Phone! I have a new phone . . .
because the battery kept wearing down. and everything transfers with a quick “transfer app”. And now nothing will download. and it’s like begining anew. Where do I find my grandson’s picture? What about changing the screen saver? and I spent an hour with the sales rep. Watching, learning, and asking questions. I have another hour scheduled for all my new worries. Same model, just an upgrade. Did my previous phone rule my life? Or did I manage it competently? I wish it worked the way I want it to . . . I wish it worked the way I remember the old phone working . . . I wish it wasn’t so complicated! I kept my old phone . . . If I plug it in – will it work? Should I do a 1:1 match for apps to see if they are ALL present? I have two phones – does even ONE work? Is new technology always better? How have you handled getting a new device? Last night I was frustrated by the time I returned to my WORK computer (FIVE DEVICES later). I was prepping files and devices for travel. That meant updating email, twitter, voxer, etc. and I was totally frustrated when I didn’t get any REAL work done. My question to myself was “Why a new phone?” so I decided to answer that in this morning’s slice. I decided that “I have a new phone . . .” would be the repeated line and I began drafting. The lines literally wrote themselves straight through to these lines about process. Ending with image, categories and tags. Wowza! When I know the topic, the post writing is much quicker and flows from beginning to end! How is midpoint best represented? Words? Numbers? Both? In Google Images, midpoint was shown on a line, on the side of a triangle, and graphed in many, many more formats. the midpoint of a boundary. The second definition represents today – the midpoint of the March 2016 Slice of Life Challenge. Are you writing one slice per day and commenting on at least three slices per day? How are you feeling about your writing? Have you met your goals? Intensifies – The reading, writing, thinking muse takes over to guide and intensify my thinking. Details – Writing long and strong about details generates more mentor texts for me. Practice – I practice genre, styles and craft moves that are new to me. Overcomes – Fear is overcome with patience and pride in published posts. Insecurities – . Doubts and insecurities are replaced with confidence and beginning seeds of competence. Notes – Records and notes the process to consider to reflect my processes. Time – Eking out precious moments of time to polish, praise, and practice writing, conferring, and praising! Brainstorming began with . . .16/31 = midpoint – midway – center. I consulted Dictionary.com for the definition, went to Google Images for a graphic for midpoint. While perusing the math examples I decided my format would be poetry, probably an acrostic to focus on Word Choice and Elaboration. Then as I reviewed my poem I thought about using the words from the acrostic as their own mini poem. Quickly drafted and added. Reviewed, revised, spell checked, categories & tagged! Last night during the “Discovering the Writer’s Life” #TWTBlog chat (Storify here), I paused at this tweet by Ralph Fletcher. Take a leap of faith. Write it. Share it. It doesn’t matter whether it is innocence or arrogance. It is worth writing. It is worth sharing. Write! It’s what we ask of our students. That same leap of faith is needed by all teachers of writing. What you say matters and is worth writing/sharing! Sharing options exist at each and every step of the writing process. As you write your next piece, deliberately stop and have a conversation at every step. Consider how that feels for you as a writer. Consider the effect on your writing. Consider a more recursive process! What would be the benefits for your students and their writing if the talk/sharing time was more than quadrupled? Would revision be seen as a “more natural process” if talk/sharing has been included at every step of the process? Tuesday is the day to share a “Slice of Life” with Two Writing Teachers. Thank you, Anna, Betsy, Beth, Dana, Deb, Kathleen, Stacey, and Tara. 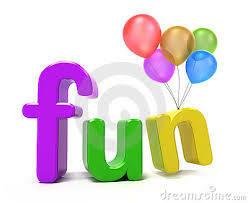 Check out the writers, readers and teachers here. Get ready to share your writerly life with the March Slice of Life Challenge! Last week was a big week for writing assessments as well as professional development planning. I was also working on some planning for future demonstrations. . . typical multi-tasking for a fairly typical week! I actually kept a post-it open on my desktop to keep track of my writing process for this blog because it was the purest “creation” that I was developing. Most of the other pieces were revisions or combinations of other past work. The picture below from Jan Burkins and Kim Yaris fascinated me last week! Stop and read that blog about the writing process if you haven’t yet, because there is so much wisdom about what each of these “steps” really looks like! Not every single second of writing is visible so take a deep breath and consider your own writing process as you develop a piece of writing from planning to publication. My mini-research: Does my writing parallel this? What was my topic for this next slice? I had spent some time in December looking at my blog data and wondering what my top blog posts were for 2014 when I wrote an average of two posts per week or at least one “slice” each week as well as a daily “slice” during March. 1 Close Reading in Kindergarten? Is it Possible? I learned two things about my process for writing blog posts. 1) I keep a list of possible blog topics. By the time a topic is put on this list, I have already begun the pre-writing process. I’m not sure that I can accurately record how often I work on “prewriting” because the list often includes two or three specific ideas about the topic. 2) I needed to add another step to the writing process. Sometimes I do collect some information/evidence collaboratively with others. However, that is NOT the step that I added as I developed this post. This post included both a picture and a table import with multiple opportunities to “check” or “preview” my work. I included that as another step in the writing process. Typically, I try to check to see what my post looks like on both a PC and a Mac because it is never the same. Maybe the “preview” is important because I worry about the “publish” button. It is still scary to push that button and then see that my post does not match my “vision” for writing. So here’s my best representation of my process for writing this blog post. Does everyone use the same exact process? What are the implications for your students? It’s the end of January, the temperature is in the 50’s and it’s also the week of annual district-wide writing assessments. I.AM.SO.EXCITED! This is the week that we celebrate student writing as we score 3rd grade narratives, 8th grade persuasive/argument letters in social studies, and 10th grade persuasive/argument letters to legislators. I wrote about this last year in a post titled, “Orchestrating Writing Assessments“. Check out the link for the details. It’s an amazing week of learning. One of the sections of the 1.25 hours of professional development that start the day is about the writing process. I could go on and on and on and on about the writing process and its importance to students and teachers, but I won’t. Instead I am directing you to an amazing blog post by Jan Burkins and Kim Yaris, “What the Writing Process Really Looks Like“. 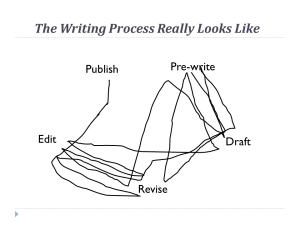 The squiggly diagram of the “real” process is so intriguing that I’m keeping track of my process and will report on that soon (in another post – I believe I need more than ONE data point before reporting – LOL). A second related post is, “How do we know that students are making progress in writing?” as well as this one, “Do I have to teach writing?” You can also search in the box at the top right to locate additional posts about writing assessment and instruction because, of course, quality instruction would be aligned with quality assessment. 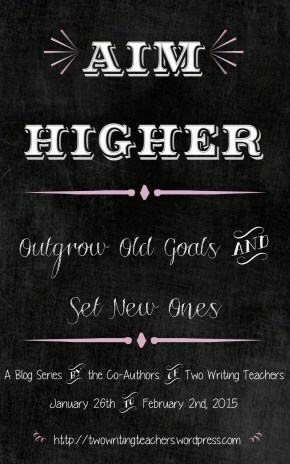 This week Two Writing Teachers have a series titled, “Aim Higher”. and it is filled with promise! Dana opened the series today with a post titled, “Aim Higher: Setting goals for editing” where she effectively describes the individualized editing checklists that she used with 5th grade students! For Throwback week, Betsy chose another of Tara’s posts, “Student Self-Assessment: Introducing the Writing Checklist” and I would be remiss if I didn’t also mention, “Work Smarter: Use Student Checklists Throughout a Unit of Study . . . and Beyond“. You will be inspired to take action after checking out these masterful resources because assessments should not just be summative in nature! And from the west coast Julieanne wrote about student responses to assessments in “Celebrate: The Power of Assessments, Part 2”, She built on Melanie’s ideas for cutting up rubrics in order to make them more “student friendly” as well as to challenge students to reach for higher levels! One final thought on assessment: What is the information that you will gain from the assessment that you are planning? Clare and Tammy at Teachers for Teachers have this thought-provoking post, “Redefining Assessment” as they use Lucy Calkins definition “Assessment is the thinking teacher’s mind work.” (Because we should know so much more about these students beyond the score on a test!) What do we know that guides our instruction? Is writing a priority in your district? How would an “observer” know? How have you added to your knowledge of assessments and their use?